As a life-long cook I’ve always loved the feeling you get finding the perfect ingredients for a special recipe. Maybe it’s ordering a nice cut of meat from a farmer you know for a family celebration. Or walking through the farmer’s market and deciding what to make for Saturday dinner based on the basket of squash blossoms you stumbled upon. It’s part of the magic of food and living in a culture that celebrates farming and quality ingredients. We are very lucky to have so much of that culture available to us here in West Marin. 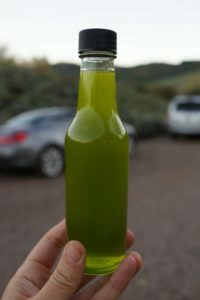 Olive oil is one of those “perfect ingredients” that humans have been relishing for thousands of years. It is now more popular than ever due to its earthiness, versatility, and documented health benefits. It’s the first and final touch for countless dishes. It is an every day item and yet, something to be appreciated and enjoyed. 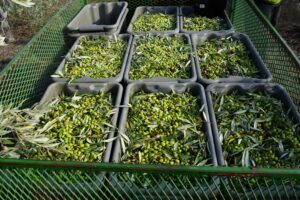 At the heart of our ranch is a 5-acre olive grove with over 750 Maurino, Pendolino, and Taggiasca olive trees. 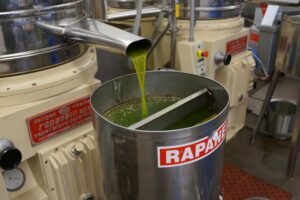 We produce a few tons of fruit and roughly 150 gallons of fresh olive oil each year. Our unfiltered oil is a rich green color with a wonderfully spicy and herbaceous flavor. It is a luxurious oil for cooking, delightful served alone with bread and a sprinkle of sea salt, and perfect as a finishing drizzle. I attend the press each year, and as the oil makes its way through the process the room fills with an amazing olive mist. The smell is incredible. That smell is captured in each bottle. We enjoy working with animals and the end result of raising and harvesting them yourself is without a doubt the best food you will eat. The taste comes from putting in the work, knowing how the animal was treated, knowing how it was slaughtered, then honoring the animal’s life in how you prepare the meal. We strive for perfection in the life we give our sheep. We manage our stocking density to ensure the animals have access to open pasture year round. The Navajo-Churro is quite adaptable and enjoys eating brush and scrub in late summer almost as much as fresh green grass in spring. We supplement with high-quality grass hay and alfalfa as pasture nutrition declines. Our sheep are healthy, strong, and beautiful. The best animals stay in the breeding program. The rest make an exceptional quality food. Navajo-Churro lamb is recognized by Slow Food USA in their “Ark of Taste,” a program created to promote the outstanding qualities of heritage breed foods. Navajo-Churro lamb is lean and has a light, delicate flavor. It is without a doubt the best lamb we have ever tasted. Pictured below is the “asador” cooking method. 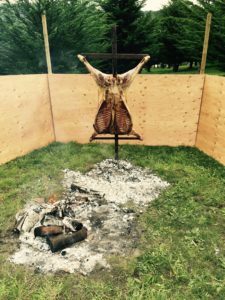 An asador can be handled many different ways, we chose to slow-roast a whole lamb on an iron cross suspended over an oakwood fire. 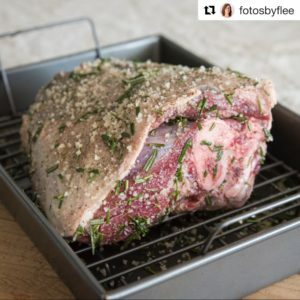 We cooked our very first ranch lamb this way, and it was an experience we will never forget! Beef is very popular in the American diet and a regular source of controversy in the news. Is it good for you? Is it bad for the environment? Personally we think meat is like everything else, best consumed in moderation and in balance with other healthy foods. We also believe knowing where your meat came from, how it was raised, and how it was slaughtered are all critical components of the healthfulness of food. There is no question that large-scale farming practices adversely impact the planet and cause great harm to animals. We believe in raising animals for food but we also know animals have hearts and minds and deserve respect. We further believe that choosing to buy meat locally from farmers has the power to fundamentally alter the structure of the American food system. These principles are the basis for our small cattle operation. 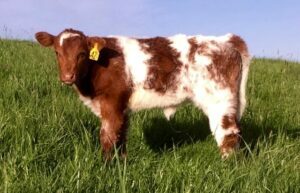 Our cattle are free-range on pasture 100% of their lives. They are supplemented with grass hay when pastures are dry and finished on top-quality alfalfa hay (never grain). Cattle have access to shade, shelter, minerals, and plenty of fresh water at all times. We spoil our animals! The result is a rich and succulent beef that must be tasted to be believed. Chicken eggs are a classic example of the difference between industrial and farm-raised food. An industrial egg is flavorless and lacks color. A farm-raised egg from a happy, free-range chicken fed a varied diet and allowed to forage is rich, creamy, with a brightly-colored yolk ranging from yellow to deep orange. Not only do the eggs taste and look a lot better, they are significantly more nutritious. 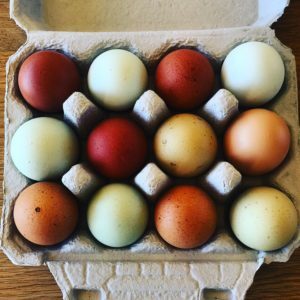 Our chicken eggs come from more than 30 breeds of layers raised on pasture year round with ample space to run, play, squawk, sun themselves, and dust bathe. We feed Organic Scratch and Peck (made with real seeds and whole grains), fresh organic greens, and the occasional raw red meat for a protein boost. We pride ourselves on our fancy multi-colored egg dozens and their taste speaks for itself. We hope after reading about our farm that you are curious about our products. Check out some of our favorite Ranch Recipes for even more inspiration. Our foods are for sale direct to customers and in select retail locations in Point Reyes Station.